Peduto is Pittsburgh’s ‘most traveled’ mayor. But what has that meant for the city? Mayor Bill Peduto has jet setted in the name of Pittsburgh more than any other mayor of this city. Harrisburg and Washington, D.C., are his most frequent destinations, but his current trip to London and France, where he was speaking at a conference, is the eighth international trip of his first term. He’s using the five-day conference to network with business leaders and government officials and sell The Pittsburgh Story. For locals, it’s a familiar tale: Rust Belt steel town turns thriving tech hub, eds and meds, et cetera. But Peduto says he sees telling that story as often as he can, especially around the globe, vital to attracting money, people and businesses to the city. 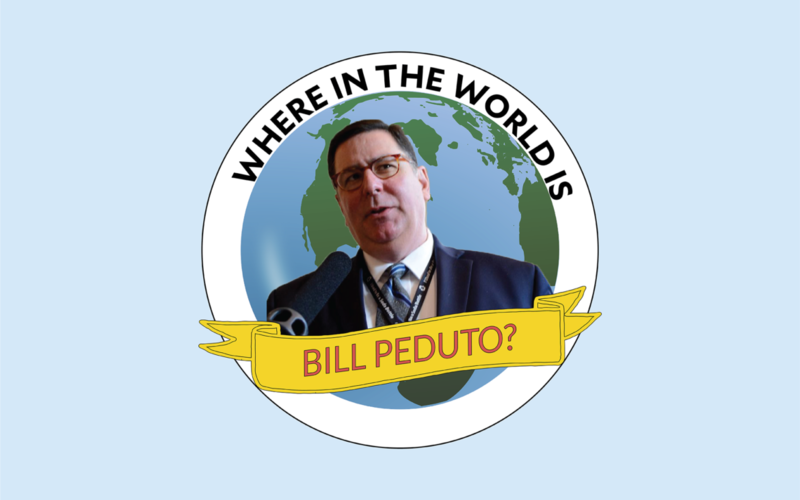 Peduto’s travels, though, are not without controversy. During May’s mayoral primary, city councilwoman and then-candidate Darlene Harris criticized the mayor for his frequent trips. At one point, she claimed the mayor had taken 280 trips. Throughout his first term, Peduto’s travels have come up again and again. So let’s set the record straight. Peduto does travel a lot, but Harris’ estimate was outlandish. Since the beginning of his first term in January 2014, Peduto has taken 62 individual trips, including his recent visit to London and France. That’s added up to just more than 200 days out of office during his 1,278 days as mayor, as of July 6. He says the time away has helped him bring in hundreds of millions of dollars in grants and other funding for the city. In return, Peduto’s travels have cost city taxpayers less than $25,000. PublicSource has compiled a database of all of the trips outside of Pittsburgh that Peduto has taken since he was sworn into office. The database was built using information obtained through a Right-to-Know request, an analysis of Peduto’s public schedules and records provided by the mayor’s office. It should be noted that the database is the most accurate information PublicSource could compile about Peduto’s travel given his office does not keep a similarly rigorous log and that two different schedulers have managed that information over his first term. Additionally, travels where Peduto visited multiple cities but did not return to Pittsburgh in between count as one trip rather than two. You can view and download the database here. This database, a layer of transparency that has not previously existed, also reveals a key way Peduto views his role as mayor and his philosophy of governing the city. When he travels, Peduto focuses on two main tasks: Selling Pittsburgh’s steel-town-to-tech-hub story to a national and global audience, and bringing policy ideas and funding back home. Pursuing these goals, Peduto says, are central to Pittsburgh’s growth and making it a place people and businesses want to come to. Peduto’s perspective is not unique. The National League of Cities — a civic networking and advocacy group whose board Peduto serves on — encourages mayors and other local elected officials to travel as a way to grow their cities. So far, Peduto’s travels seem to have paid off. He points to several examples of trips resulting in a direct benefit for the city, including $11 million in grants from the U.S. Department of Transportation after he met with former Secretary Anthony Foxx several times. There was also, he said, a $30 million grant from the Department of Housing and Urban Development to rebuild Larimer that resulted from trips to Harrisburg and Washington, D.C., and a $200,000 grant the city received to kickstart its bike lane projects after he visited Denmark. Other direct benefits, Peduto said, include $5 million the city received from The Rockefeller Foundation after he traveled to Italy. Pittsburgh was also chosen as the host for the 2016 National League of Cities conference not long after he became an active member of that organization; more than 3,000 people visited the city, staying in the hotels and eating at the city’s restaurants. 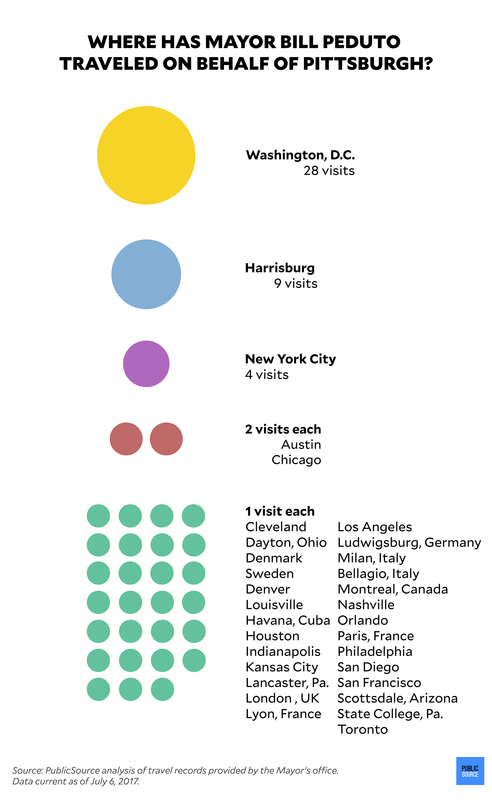 In total, Peduto has visited more than 30 cities worldwide representing the city of Pittsburgh as mayor. Usually, the mayor travels close to home, frequenting Harrisburg and Washington D.C. He’s visited those places nine and 28 times, respectively, mostly due to his involvement with the Pennsylvania Municipal League, the U.S. Conference of Mayors and the National League of Cities. But the mayor has also made stops in Canadian and European cities as well as Havana, Cuba, in an attempt to strengthen economic relationships between the Latin American city and Pittsburgh. When Peduto travels, Pittsburgh taxpayers rarely foot the bill. 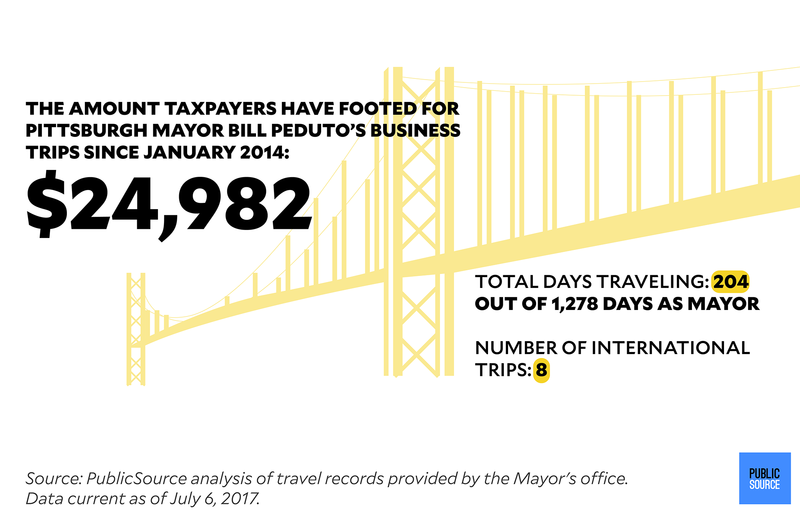 In total, residents have paid $24,982 for the mayor’s trips over the years, hardly even a fraction of the city’s nearly $540 million annual budget. The records show an additional $3,365 in expenses that the host of a conference paid; the records did not indicate the amount of expenses paid by other conference hosts. Usually, Peduto’s hosts will pay for his airfare and hotel costs, and he’ll sometimes pay for his own meals and other expenses if they’re not provided, though the city does pick up the tab on occasion.When residents do pay for Peduto’s trips, they reimburse him for money he’s already spent. Peduto says he does not have a credit card that he uses to charge the city unlike his predecessors. When he’s choosing to travel, Peduto said he’s cognizant of the cost and time spent away from the city. When he meets with his assistant and scheduler each week — typically a two-hour affair — he considers invitations to travel that he’s received. Invitations from the U.S. Conference of Mayors, the Pennsylvania Municipal League and the National League of Cities get first priority because he is an active member in those groups, and the city typically foots the bill for those trips. Peduto is president of the Pennsylvania Municipal League’s board, a board member of the National League of Cities and a member of the U.S. Conference of Mayors. Peduto said he will not travel internationally unless his hosts pay. For other domestic trips, Peduto usually inquires if the host can pay for part of the trip. Occasionally, Peduto will use funds from his campaign, People for Peduto, to pay expenses he thinks might be perceived as political. For example, when Peduto traveled to Denmark for a bike lane conference, his campaign paid for the flights (his hosts paid the other expenses), and when he traveled to California for a policy and networking conference, his campaign chipped in $165 (again, the conference hosts paid for everything else). Campaign finance documents also show that People for Peduto paid for the mayor’s expenses when he traveled to Philadelphia last summer for the Democratic National Convention, including his flights, hotel and several meals from local restaurants. Above all, Peduto says his travels help solidify Pittsburgh’s emerging role as world leader, especially given the city’s hopes to grow its population and lure businesses. He points to Carnegie Mellon University and its status as a leader for robotics — which he frequently touts — earning them a $250 million grant from the Department of Defense earlier this year. That kind of clout only benefits the city, he said. Graphics produced by PublicSource Interactives & Design Editor Natasha Khan. Since I don’t live in the city limits, I could not vote against this scammer. Unfortunately, turdtown politics also flow out across the county, and that does affect many folks. Peduto is a real piece of work. Randy McDaniels, TLC.